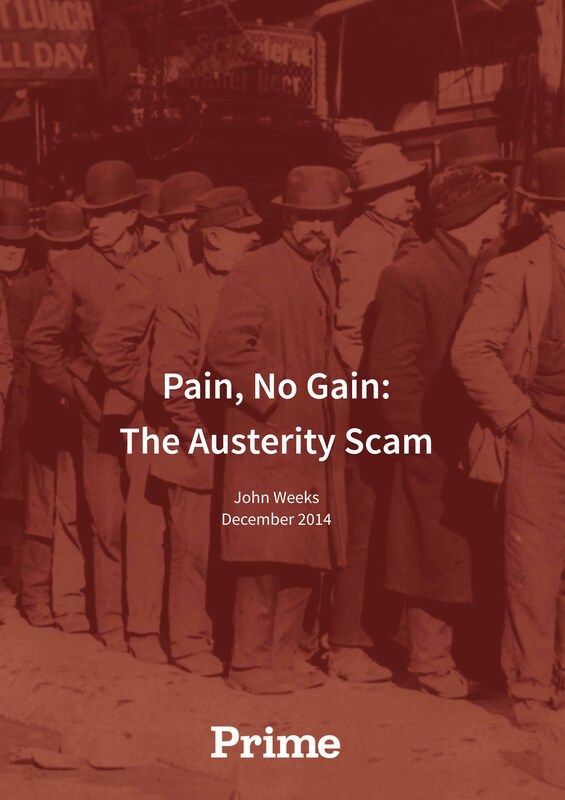 To coincide with the Autumn Statement, PRIME Economics has published an excellent short pamphlet Pain, No Gain: the Austerity Scam by John Weeks (Emeritus Professor of Economics, SOAS, University of London) which explains just why the deficit is not a problem – indeed is a necessary part of the solution – for the UK economy. In examining the history of the deficit and its causes, Prof Weeks not only explains the folly of austerity, but also the mistaken blame doled out to Labour for “causing the crisis”. In fact, Gordon Brown had done much to bring Britain out of the crisis and, until the 2010 election campaign, was himself rejecting cuts in public budgets. On the other hand, apart from his Bloomberg speech, Brown’s protégé and the next would-be iron chancellor, Ed Balls, is now an enthusiastic advocate of austerity – whose differences from Osborne are described by Prf Weeks as “ones of emphasis not principle“. Indeed, in a week full of comment on how history might view Gordon Brown, we might well wonder whether future historians will conclude that Brown’s protégé exerted a negative influence on him – his best performance having been in the period when Ed Balls was assigned to non-economic duties. Alas, say Prime, “all parties” are wrong. An emphasis on “cutting the deficit” via reductions in government expenditure as the core of policy may provide useful cover for those whose real agenda is the political one of reducing the size and role of the state, but it is not a sensible or effective economic policy. It should certainly not feature as the central policy for any party with a social democratic mission. And the Coalition Government’s austerity strategy has paradoxically – yet logically – failed to reduce the deficit as a percentage of GDP as planned, with a gap of some £50 billion between what was planned in 2010 for the current year, and what is now the case. Chancellor Osborne cannot blame Labour for his woes. They are self-inflicted. The public sector balance remains deep in the red because of the stagnation of public revenue over the four years of Coalition government. The chart shows that the Brown government left Mr Osborne an improving budget balance, because the UK economy was in the early stage of recovery. The majority of the electorate in 2010, argues Pro Weeks, voted for major parties (Labour and the Lib Dems) who opposed fiscal cuts, but what they got, following the Clegg U-turn, was an austerity government. Thanks to Ed Balls, in 2015, the electorate is offered continuing austerity by all three major parties in spite of its abject failure. Click here to download the publication. It well worth a read. Posted in: Books, Conservatives, Economy, Labour, Macroeconomics, Politics, Public services, Public Spending, Taxation. Good points and I wish Labour would nail the Tory/Lib Dem propaganda that Labour was to blame for the financial mess. Although New Labour didn’t help cosy-ing up to the City Labour had to step in to save the banks and people’s wages, savings, pensions and benefits or there would have been chaos. But the Tories and Lib Dems never say what they would have done? You just need to read the evidence from recent history see Lehman Bros, Fannie Mae etc. Unfortunately for the Tories history keeps throwing up more evidence – City Group fined £4b July 2014 for their role in snub prime lending and JP Morgan Chase 13b dollars in 2013! No good deed goes unpunished! Jon – Perhaps it’s time to consider voting for a non-austerity proposing party?